Newport Beach Ca is a slice a perfection. Gorgeous beaches, a pristine harbor, mild temperatures, and upper class culture. 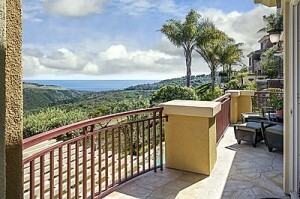 Residents of Newport Beach expect the best service possible. This includes waterproof deck repair for balcony becks, roof decks, stairways, walkways, patio decks and pool decks. Enter Prestige Deck Coating. That’s right. Prestige. What could be a better match for Newport Beach sensibilities than a company called Prestige. We value personalized customer care, premier products, and professional installation. If you want perfect plywood repair and beyond, you have come to the right place. Our crew recently traveled to Newport Beach to modify a deck coating with a pooling problem. Pooling is bad, because standing water leads to eventual dry rot and structural damage. Sloping. 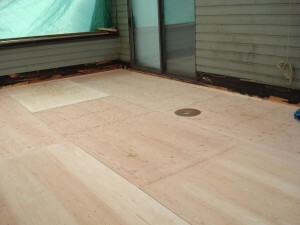 This particular decking needed 3 buckets of material to fill lows spots on the deck. Decks are built with sloping, but often, if they are down improperly, it leads to standing water. So we re-sloped the deck surface properly. Perfect Plywood Repair. We needed to repair the dry rot caused by the standing water. We removed the damaged plywood and re-install 3/4 inch tongue and groove plywood. After we laid the plywood repair ground work, we were ready to apply our custom 5 layer deck waterproofing system. We installed our Crete Decking System. This is a multi-layer waterproofing membrane designed for use over plywood sub-floors. Perfect Plywood repair is a cinch with Prestige Deck Coating. Our foremen have at least 30 years experience in the deck coatings industry. We offer up to a 10 year warranty and free estimates. No pressure, no commitment. Call us today! Watch our plywood repair skills in action!